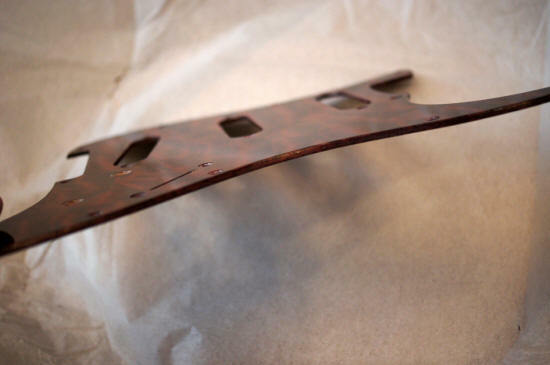 Gilroy guitars of Australia make a very special wooden scratch plate for Fender Stratocaster guitars and others. They are moderately expensive and look awesome but just how good are these things? and is it really worth the effort? Don't be surprised if you have never seen this maker of fine wooden scratch plates for Fender Stratocaster's before.. Australia is a long way away for most of us (unless you live there). 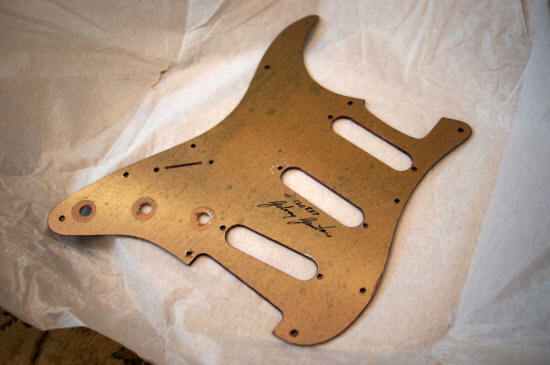 I came across this maker when I was making by 'Brown' Stratocaster as also reviewed on this website. I wanted a scratch plate or 'pick guard' as some guys call them, that was different and was going to make you say 'wow where DID you get that from'. So when I was looking on their website I saw this fantastic pick guard made by 'Peter' who is the man when it comes down to this sort of exquisite and rare sort of upgrade for your stratocaster. Above is the one I chose for the guitar I was making, but in reality when I got the scratch plate, I decided it was a little too dark for that particular guitar so I did not fit it. The pick guard is made of Quilted Maple as you can see in this image and is made flawlessly. It was an exact match for the model of guitar for what I wanted (basically a 62 style stratocaster) and looked awesome. The finish is second to none - they take great care over that finish and spend long hours getting the overall final product just right. The scratch plate is signed by Gilroy Guitars as well as serialized so these things are really a one off and you can bet that no other guitar in the world will have the same top as yours with one of these fitted. Gilroy Guitars hand make these, laboriously, one by one, so they are not your average $30 pick guard, but that's not what you wanted if you buy one of these... is it? These are really well made plates and I have never seen anyone make them as cool as this before - and they even send you a free screening plate to stop all that unwanted hum! There's something special about these guys... I think its something to do with that Fosters stuff they drink... they have crocodiles too... so I'm not going to argue... but these guys are not good at cricket... nobody's perfect. But this is one cool supplier you might well have just missed. And they always have lots of time for you too. A nice refreshing change. But don't hold that against them - these are seriously great guitar pick guards and quite unique. I don't know of another company doing anything like this so I thought I might tell others about this supplier. Overall score is 9 out of 10 and this one can be recommended! And its only 9 because of the distance. So if you are looking for a custom scratch plate like no other - check these guys out... Tell em Tony sent ya... Here's their website again.